Silhouette time again. 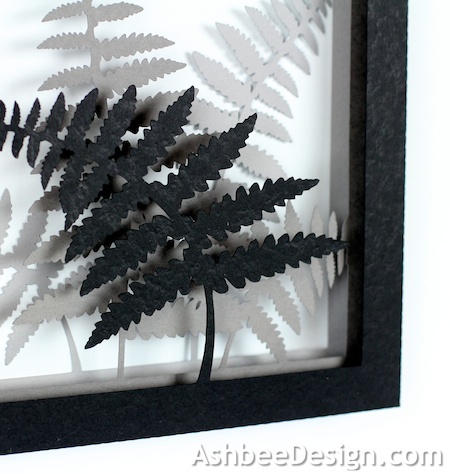 I spent some time this weekend developing another 3-D shadow box using my Silhouette Cameo cutting machine. This time I used ferns as a theme. Our home is nestled in a sea of ferns this year and I find spring time ferns to be so beautiful. It was a natural theme for me. This time I stayed true to the silhouette concept and worked in a gradation of blacks and grays. Here is a closeup of the layers. It is composed of three layers, each in its own shade. 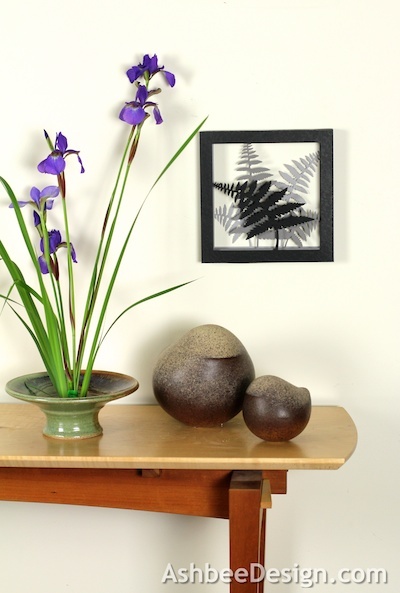 I created the composition by first scanning a live fern and then using that file to create additional ferns. I need to get some more paper and try some other color combinations. A gradation of greens is a natural but I also think using the same composition but doing it in vibrant colors would look wonderful in a child's room. As always not enough time to play. Tutorial to come later this week. 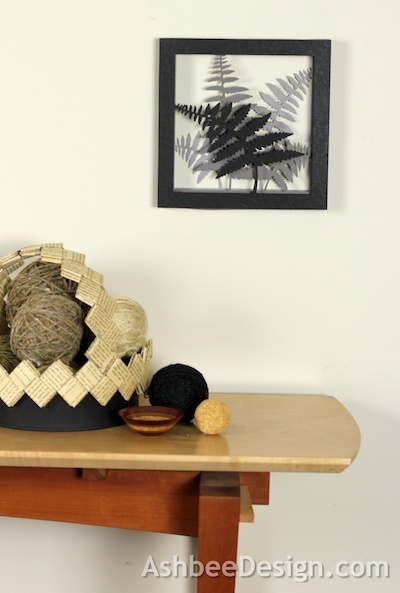 Update: The tutorial is up here at my new sister blog with Silhouette tutorials. 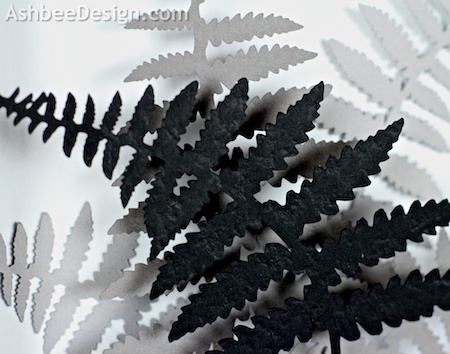 The cutting file is available from Silhouette here. Disclaimer: I am not representing Silhouette however I am working to become a contributing artist for the Silhouette online store. When that process is complete you will be able to buy my Silhouette cutting files through the Silhouette online store. Soon I hope. Stay tuned! Perfect! I love your mind. Simple. But go here to my Silhouette blog to see a tutorial. Love the design concept Marji! I've not tried scanning anything to use with my silhouette so far. I take you just save it as a jpeg and use the trace feature? It was a little more involved. I scanned it, brought it into Pixelmator to outline it and turn it black, brought that into iDraw and isolated some leaves of the fern. 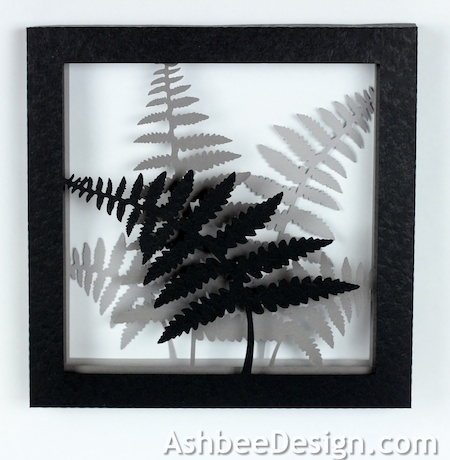 I then "grew" my own ferns from the parts so I could control the composition. I then saved that as a pdf, brought that into Silhouette and used the trace feature there. I do believe I could have just opened the jpeg and traced it though. So neat!! Thanks for linking up at Romance on a dime! !